Do you like fighting games? It is hard to find a good one made in Flash these days, but developers around the world just keep amazing me! If you like the types of games where you are fighting against multiple opponents and working your way up towards the big boss fight, then you have to play Electric Man 1! It is a game stripped of everything that is not related to the fighting mechanism and it focuses solely on the battles you will take part in. The commands are quite ordinary and should give you no trouble. 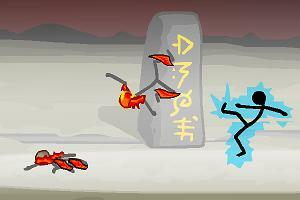 You can move with the arrow keys (the down arrow key is for tumbling and dodging) and attack the enemy with A, S and D keys or alternatively use special attacks with Q, W and E. There are a lot of opponents you will have to deal with to progress through the rounds and once you start to play Electric Man 1 you are bound to get addicted! The graphics are fairly good and there is a nice soundtrack playing through all of your battles. You can use basic attacks or drain your battery points to use special moves that are very powerful and deal tons of damage as well as cause slow motion visual effects that create that “wow” factor. It is a very good game, but lacks a competent storyline and character progression and customization. Still, I recommend that you take the time and play Electric Man 1 if you are a fan of this genre.